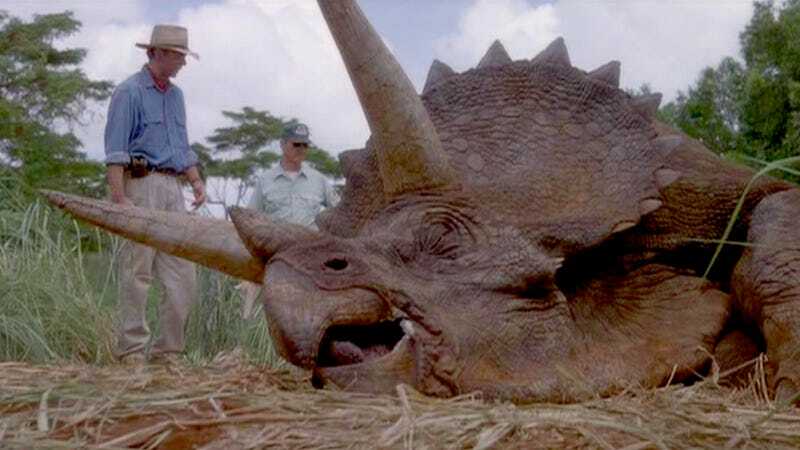 If you cried over the sick Triceratops in Jurassic Park, or just loved this horned dinosaur as a kid, there's one scientific controversy you need to understand right now — it may wind up demonstrating that Triceratops isn't who we thought it was. Recently unearthed evidence has sparked a new debate over the identity of several ceratopsid dinosaurs, including our beloved Tri, who many paleontologists believe is simply the young version of a creature called Torosaurus. But if a Triceratops is just a young Torosaurus, is Nedoceratops what comes in between? Or are they actually three different species? Here's everything you need to know to take a stand on this controversy. Classifying dinosaurs is difficult under the best circumstances. With the ceratopsids, circumstances are not ideal. Incomplete specimens, damaged bones and small sample sizes plague researchers. For example, it would be a lot easier to assign an age to Torosaurus skulls if we had some complete skeletons to go with them. Worse, many specimens have been reconstructed incorrectly, making their morphology appear misleading. The worst case scenario is when there's only a single specimen for an entire genera, making it impossible to know if it really is a separate animal, a variation in the morphology of other animals, or an aberration caused by disease or injury. The ceratopsid controversy starts with two similar animals, Triceratops (of three horns and a solid skull frill) and Torosaurus (of three horns and large perforations, or fenestrae, in the skull frill). Paleontologists have found quite a few Triceratops skulls, but only a half-dozen Torosaurus skulls. Then there's Nedoceratops. There's only one existing example of a Nedoceratops (which you can visit at the Smithsonian Museum of Natural History), and there's some evidence that the specimen might be abnormal – there are some assymetric bone densities in the skull, and the fenestrae appear irregular — Torosaurus' fenestrae are round and quite regular in shape. The classification of ceratopsids is kind of a mess. When the first specimens were found, paleontologists assigned a new genera or species to pretty much every horned skull that looked a little different from the other horned skulls. There were 16 different species of Triceratops at one point. There's been a trend in the last decade or so to try and consolidate some of those genera and species. Linking previously separate genera would change what we know about biodiversity in the late Cretaceous and reshape our ideas about ceratopsid evolution. Triceratops and Torosaurus are the same animal. In 2010, a study suggested that Torosaurus is really the adult version of Triceratops. We reported on that study when it came out, and at the time it made a lot of sense. The two dinosaurs are pretty similar, and loss of bone material is certainly something that can happen to an animal as it ages. There's even precedent for it among other dinosaurs. Sauropods (huge, long-necked herbivores like Apatosaurus) sometimes have bone formations in their skin known as osteoderms. The discovery of hollow osteoderms near mature specimens suggests the bone material may have been reabsorbed during lean years to provide a steady supply of essential minerals. Torosaurus has a massive skull, so it's possible that as it aged, Triceratops reabsorbed the bone and developed fenestrae to reduce the weight of its enlarging frill. Also lending credence to the theory: the geographic distribution of both genera overlap considerably. Nedoceratops is the same animal as Triceratops and Torosaurus. John B. Scannella and John R. Horner of Montana State University released a study that concludes Nedoceratops is an intermediary step in the transition from young Triceratops to old Torosaurus. Although the holotype (the only known specimen, or the formally recognized exemplar) for Nedoceratops doesn't look much like your average Triceratops at first glance, Scannella and Horner looked at all the examples we have of Triceratops and found some that are fairly close to what Nedoceratops looks like. Nedoceratops is missing that nose horn, but lots of Triceratops had really small nose horns, so it might just be within the range of expected variation, or the nose horn might have been lost to injury. On top of that, the Nedoceratops holotype's fenestrae are smaller than Torosaurus', suggesting they are in the process of growing into the large fenestrae of Torosaurus. Scannella and Horner also found thinning in the frills of some Triceratops skulls in the same area as the fenestrae. As for the difference in horn angle, it might be individual variation, or the orbital horns might shift with age. Nedoceratops is a separate genus or an abnormal Triceratops. Andrew A. Farke (Raymond M. Alf Museum of Paleontology) disputed Scannella and Horner's claims, noting that the single specimen of Nedoceratops just doesn't give us much to go on. It's been partially reconstructed with plaster, so it's hard to tell if it would have fenestrae on both sides of the frill. A lot of Farke's work is based on bone texture, which is used to estimate the age of the dinosaur when it died. According to his analysis, the existing Nedoceratops appears to be a mature animal – it's unlikely it would "grow up" to be a Torosaurus because it's already grown up. Triceratops and Torosaurus are not the same animal. The most recent study, by Nicholas R. Longrich and Daniel J. Field of Yale's Department of Geology and Geophysics, attempts to dismantle the Triceratops/Torosaurus theory. Their analysis suggests that Triceratops and Torosaurus specimens show a range of ages, with some possile immature Torosaurus specimens, and a wide range of size and maturity among Triceratops specimens. As for Nedoceratops, Longrich and Field discount it as, "clearly pathological…the opening in the parietal is also irregular in shape, which strongly suggests that it is the result of injury or disease, and not a natural feature." They conclude that all three ceratopsians most likely belong to different genera. The cool thing about the whole debate is how it shows off science in action. Everyone on all sides agrees that there are some things we can't know for sure due to insufficient evidence. Until we find some more Nedoceratops specimens, more complete Torosaurus specimens, or find some other way to conclusively link (or unlink) the specimens we have, the debate will continue. It's an admittedly friendly debate, with paleontologists geeking out over their shared love of dinosaurs. We've also already learned a lot from the debate – the fact that dinosaurs' morphology could change drastically over the course of a lifetime has been placed under focus, and could seriously change how we look at dinosaurs we know and new ones we haven't discovered yet. This is also a really good example of open source science. All of the studies mentioned in this article are available to be read in full, for free, at PloS One (see the sources list). Andrew Farke (who writes a blog about open source paleontology) even put all his field notes online under a Creative Commons license, so you can see his sketches and measurements of various specimens. Farke, AA (2011). "Anatomy and Taxonomic Status of the Chasmosaurine Ceratopsid Nedoceratops hatcheri from the Upper Cretaceous Lance Formation of Wyoming, U.S.A." PLoS ONE 6(1). Longrich NR, Field DJ (2012). "Torosaurus Is Not Triceratops: Ontogeny in Chasmosaurine Ceratopsids as a Case Study in Dinosaur Taxonomy." PLoS ONE 7(2). Rogers, Kristina A. Curry & D.Emic. Michael D. "Triumph of the Titans." Scientific American, May 2012. Scannella JB, Horner JR (2011). "‘Nedoceratops': An Example of a Transitional Morphology." PLoS ONE 6(12). Switek, Brian. "Nedoceratops: To Be, or Not to Be?" Smithsonian.com. Underwood, Emily. "Nedoceratops hatcheri: Transitional Triceratops or Different Beast?" Earth, March 2012. Photos: PLoS One, South Dakota Museum of Geology.